One of my great passions is interior design. So when my grandmother passed away, I asked my mother if I could have an antique chair she kept in her bedroom. I also asked for a set of her china. I didn’t ask for a set of china because I think I need china. My grandmother was well-traveled. After a trip to London, she taught me about tea. I was maybe 6 or 7. 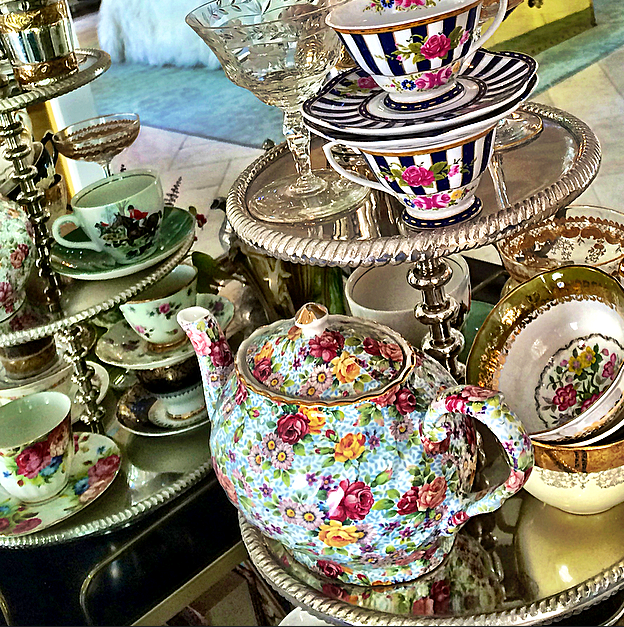 As my grandmother’s granddaughter, I never had to pretend I was having a tea party. She’d bake rolls for us and bring out her most beautiful cups and saucers. 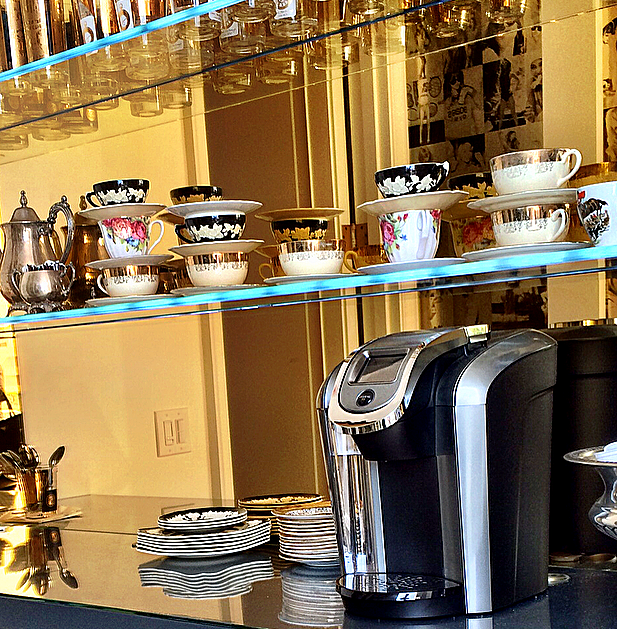 She’d polish silverware just for our afternoon tea. We would sit in her family room at an actual tea table with 2 matching chairs, where she taught me how to sip tea as well as put butter and jelly on a roll with a real butter knife. Yet, if you were to sit down with me now, I’d conveniently forget those things and, depending on where we were, smear the end of the roll across a pat of butter on my bread plate and shove it into my mouth. She also taught me how to stir sugar in my teacup with a teaspoon. Really, there’s only one way, but…(shoulder shrug). 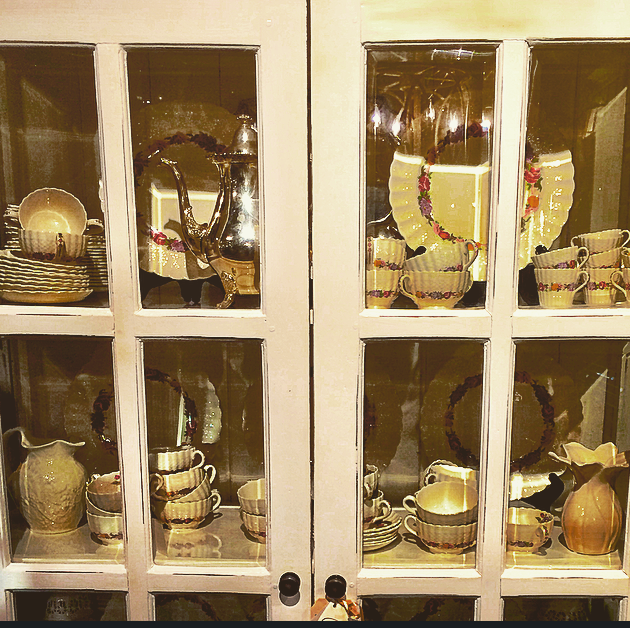 We’d pour milk out of a creamer, detailed in the same pattern as the the cups and saucers, which also matched the sugar bowl…and the sugar inside matched her stories. And in writing that, I realize my grandmother brought much more than just tea to me. You see, despite her worldly travels, she wasn’t jaded, this gem of a human. She’d tell me about her childhood; how her mother abandoned her and how her “daddy” was wonderful. Then she added how she was once “poor as a church mouse,” but reminded me that being rich in love was most important, anyway. She’d also tell me about London, Princess Diana and how wonderful she was to everyone. When she’d recount the places she’d been, she didn’t miss a detail or fail to articulate the beauty of her experiences and what life lesson was learned, (with the most humble heart). At the time, I didn’t fully understand the undertones of what she was trying to say. I was disillusioned by my days at the neighborhood pool, where the only care I had was hoping the bottoms of my feet wouldn’t burn when the “ice cream man” rolled into the parking lot. Oh, and if I had enough change for a bomb pop. So, earn your own dimes and marry a hardworking church mouse who makes me feel rich in love? Little did I know, she was equipping me with sentiments I’d carry in my heart to this very day. It’s almost as if she knew I’d live in a city where some people don’t learn about tea. I’m just thankful I didn’t forget how to stir in the sugar. I never forget the sugar. Ideas for displaying china. Stack it, mix it or match it–just don’t forget to use it. Wildfox Store, Sunset Plaza. Los Angeles.